Poppies at Play: Giveaway Day!! Are you ready to get excited?? Well today is our lucky day because we have a rockingly-awesomely-sweet giveaway brought to you by Bedroomfurniture.com who is a part of CSNStores.com. Oh yeah baby!! I knew today was going to be fun!! Haven't heard of them yet?? Well pop over and check out their amazing collection of PLATFORM BEDS! You know you want one!! They have a great selection and really decent prices! They definitely have me drooling!! Bedroomfurniture.com has been EXTREMELY generous today by offering 2 lovely wall hanging giveaways!! 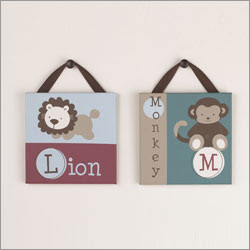 The first is a CoCalo Baby-Jackson 2 piece canvas wall art set. They are 10''x10'' and just way too cute!! They retail for $28.99. Click HERE if you'd like to get more details about these lovelies. If that wasn't enough they are also giving away these adorable wall hangings. 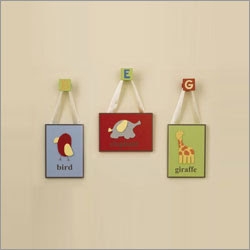 These are CoCalo baby-Alphabet Soup three piece decorative wall plaques and they retail for $27.99. Click HERE for more details. Bedroomfurniture. com by dropping by their site!! To enter this giveaway please leave a comment and specify which wall plaques you are most interested in winning. Contest will close on Wednesday evening and the winners will be announced on Thursday morning. If you are chosen please email your address to poppyginger@gmail.com. Good luck!! Fun giveaway! I love the Alphabet Soup set. It would be perfect for a kids room! Cool Giveaway! Thanks for Hosting! I love the Cocalo-Jackson pictures but both are adorable! Way Cute! love the alphabet soup one!! Wow, I love the Alphabet Soup set! Way too cute; it would look great in my Goddaughter's playroom! I love the CoCalo Baby-Jackson. Both are very cute! It's a toss up, I love them both!!! I would love either they are adorable! I was just checking out their site, we are working on my little guys room right now (I'm 34 weeks pregnant) these are so cute!! I like the alphabet ones the best. I love the colors & the simpleness. Sorry Andrea...the Kristina is my comment. My babysitter had logged on to view some wedding photos. I LOVE LOVE LOVE The Cocalo Baby-Alphabets the best! I love the Cocalo Baby Jackson! It actually matches my sons nursery!! Andy, you rock! I like the Baby-Jackson ones best. Too too fun! Hi Andy, I am a friend of Heather Jordan's. I love seeing all the amazing things you make! I love the Cocalo Baby-Alphabet Soup the best! I love the Cocalo Baby-Jackson ones the best. They are too cute!! What a nice giveaway! I love the Cocalo Baby Jackson. Fun contest...thanks Andrea! We often call Bright our little monkey...so it would have to be the CoCalo Baby Jackson set! I just discovered your site YESTERDAY! I stayed up till 2 looking at everything and writing ideas down in my notebook! I'm even going to the DI today to see how lucky I get! Thanks for your blog! ya and, I love giveaways! I love the alphabet set. LOVE BRIGHT!